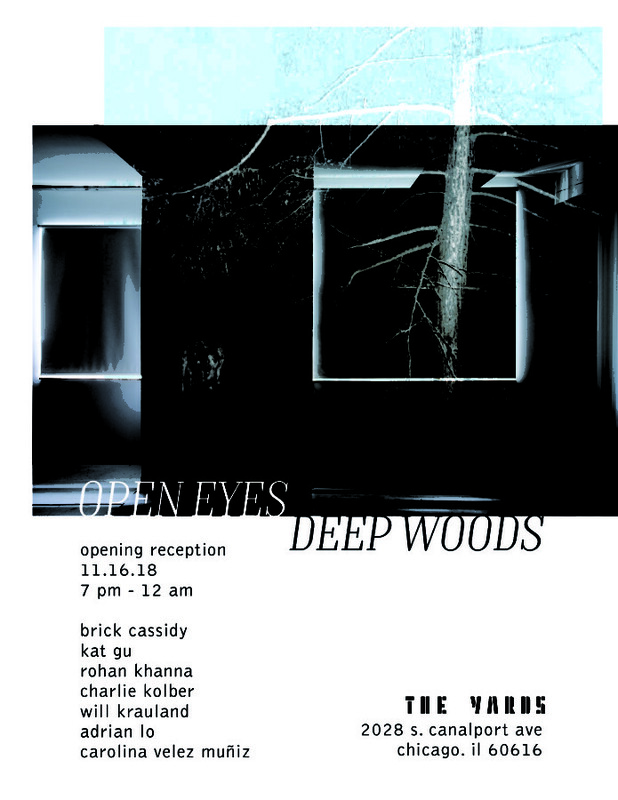 The Yards is pleased to announce its first group show Open Eyes // Deep Woods, which will run from November 16th to December 2nd, 2018 and display the work of Brick Cassidy, Kat Gu, Rohan Khanna, Charlie Kolber, Will Krauland, Adrian Lo, and Carolina Velez Muñiz. Open Eyes // Deep Woods aims to explore indeterminacies of perception by examining adaptation and response to ever-changing yet omnipresent stimuli. This exhibition, comprised of pieces ranging from the playful to the solemnly poetic, functions not only as a showcase of artistic aptitude but also as a sensory and psychological experience – akin, perhaps, to finding yourself lost in deep woods. Because of the unique light-activated nature of this show, there will be two distinct receptions: an opening held after nightfall (November 16th, 7 pm – 12 pm) and a closing held during the day (December 2nd, 12 pm – 4 pm). We encourage our viewers to attend both in order to fully experience the unique potentiality of the work. Brick Cassidy accumulates information from passers by and responds with objects and images. Brick grew up in the suburbs of Chicago and will receive his BFA From SAIC in the spring of 2019. Brick has shown at Triumph Chicago as well as Site Galleries at SAIC. Xingzi Gu (Kat) works primarily with painting, found items, and organic material. She received her BFA from School of the Art Institute of Chicago in 2018. Her work has been exhibited in China, New Zealand and the United States. Xingzi currently lives and works in Chicago. Will Krauland (b. 1995, Washington, DC) is an artist living in Chicago, IL. He received his BFA from the School of the Art Institute of Chicago. Recent exhibitions and performances include: Jamais Vu with Thomas Huston at Apparatus Projects (2018), Tiny Garage Series with Alp Seyrekbasan at dfbrl8r Gallery (2017), The Terrain Biennial, hosted by Kelly Kaczynski (2017), Location at The Radius (2017), Come, but please don’t stay curated by Evelyn Sum (2016), and Open ’til Tomorrow at Red Door Gallery (2016). Carolina Velez Muñiz is a Mexican artist living and working in Chicago. With meticulously repetitive motifs and folkloric colors, she illustrates the playful coincidences of clashing ideologies that make up the globalized Mestiza identity. Carolina is pursuing her Bachelor of Fine Arts in Studio with an emphasis in Painting and Weaving at The School of the Art Institute of Chicago. She is currently working as a Curatorial Assistant in the Roger Brown Study Collection and as a Lab Monitor both in The Department of Fiber and Material Studies and in the StudioLab of The Department of Painting and Drawing.